I’ve been making my own vegan buttery spread for a while now, and let me tell you – if you choose to imbibe in vegan butter (which we do because…butter), this is a great option. It’s quick, easy, delicious, customize-able, and a hell of a lot cheaper than buying store-bought. Because of my deep affinity for all things savory, I have spent my fair share of time experimenting with different garlic/herb combinations using this recipe (and they have been wonderful – oh. so. wonderful. ), but my dear husband with his raging sweet tooth felt a little left out. No spices or seasonings?! None?! No, no, no. This would not do. 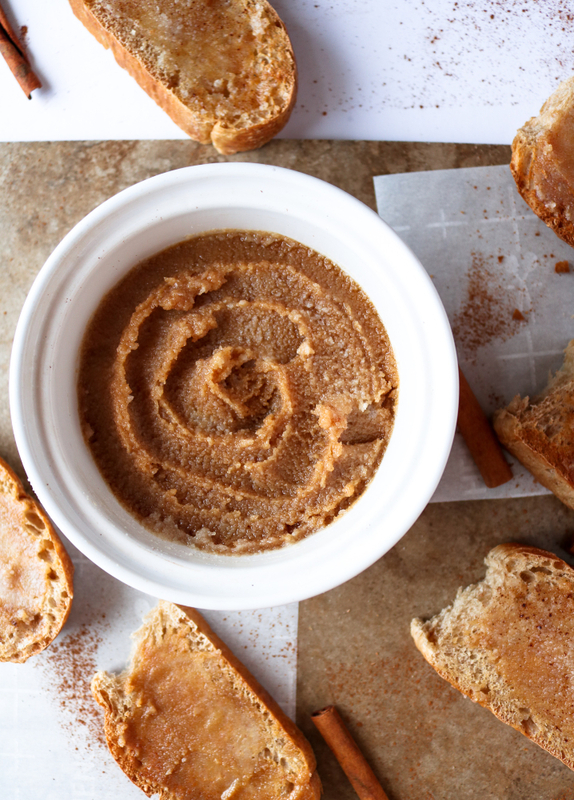 A few dozen kitchen experiments later and enter, this glorious cinnamon sugar buttery spread. Sweetened with coconut sugar and vanilla almond milk, this butter is absolutely perfect for a rainy weekend morning of pancakes or French toast with hot coffee and purring cats (our personal favorite) or for replacing dairy butter in all your favorite baked sweets. 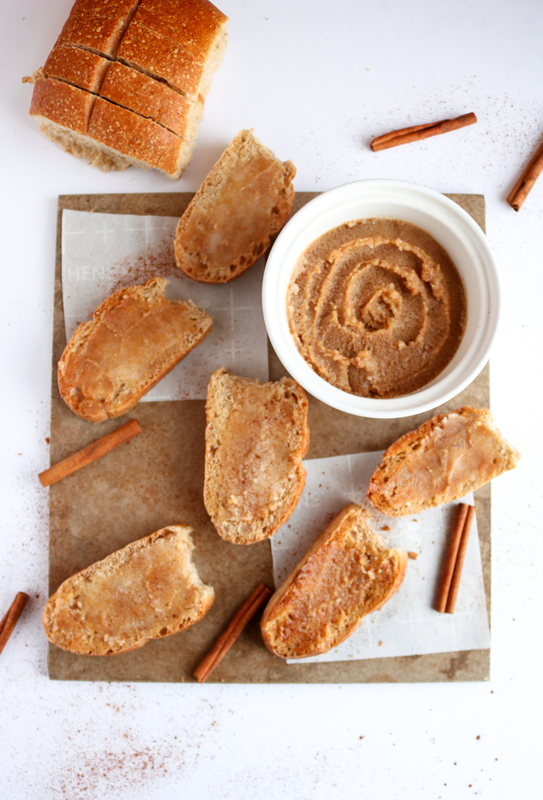 We’d LOVE to see all the awesome ways you decide to use this cinnamon sugar buttery spread. If you do make it, be sure to tag us in your photos on Instagram. We’re @theplantpowercouple with the “the”. Enjoy! 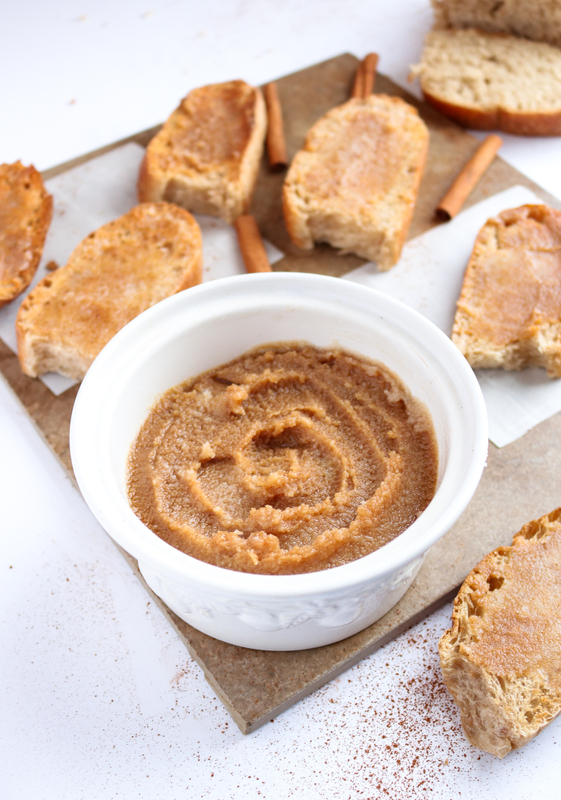 Make your own vegan cinnamon sugar buttery spread! It's incredible on a simple morning toast, pancakes, or even in baked goods. Easy AF to make with only a few ingredients. Heat a small sauce pan on medium and add your coconut oil. Allow it to melt, slowly stirring, and (while still hot) stir in coconut sugar until it is completely dissolved. Pour this mixture, along with the rest of the ingredients, into a blender or food processor and blend on high for at least 1-2 minutes, until smooth and creamy. Pour into a container, like a butter mold, ice cube tray, or any container and place in the fridge. Leave in the fridge overnight to set. If you're in a rush, you can also let it set in the freezer, but in my experience the texture is better when it sets in the fridge. Enjoy on pancakes, French toast, in cookie recipes, on toast, etc. Hi there!!!! Can't wait to make my own "butter"!!! Is there something I could sub for the Sunflower Oil??? Hey, Brenda! Sunflower oil is what gives this recipe that strong, buttery flavor. It's often what's used as popcorn butter at movie theaters! If you cannot find it though, I have used safflower oil with similar results. Let us know how it goes!